The deeper the green, the more a place's population increases during the daytime on a weekday. The deeper the gray, the more it decreases. Cities/towns/villages are clickable, with more info. Both a map and table are in large-format above -- scroll all the way up. + It's not surprising that the city of Albany tops the list for biggest daytime population swing -- its downtown is full of offices, including the ESP. And it also has the Harriman office campus uptown. But we were a little taken aback by the how large the difference is -- an increase of 2/3! The large swing is a boon for a city. But it also points to some of the challenges -- like parking and maintaining infrastructure for all those additional daytime workers. + Again, Colonie and Saratoga Springs' spots near the top aren't much of a surprise. But check out tiny Ballston Spa representing with a 21 percent increase. + Conversely, we expected Troy and Schenectady to both have bigger daytime increases. Especially Troy -- its downtown always seems packed during the daytime. + The fact that suburban places like New Scotland lose a lot of their population during the day isn't unexpected. But Cohoes and Watervliet -- more urban places in the Capital Region core -- also see large daytime decreases. + These numbers are based on 5-year estimates from 2006-2010 (explained below). We have feeling the next set of estimates will show Malta -- with the GloFo fab -- swinging closer to the break-even mark, if not into the positive. + All population and commuter data are from the US Census Bureau. The numbers are from the 5-year estimates for the American Community Survey 2006-2010. These are estimates, and for some of the smaller population places, the margins of error do start to grow, so a grain or two of salt to keep in mind. + We had this idea to build the map after reading Kenneth C. Crowe II's recent story in the Times Union. So, a tip of the hat to him. + And thanks to Inquiron for the super-easy-to-use shapefile to KML converter. "The large swing is a boon for a city. But it also points to some of the challenges -- like parking and maintaining infrastructure for all those additional daytime workers." 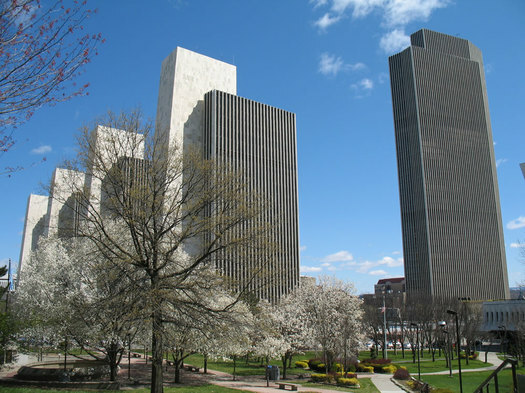 The challenges that Albany faces with its large swing in daytime population might also support moving more state agencies to locations outside the city and county. One can argue that in today's digital world there's less need for many state agencies to be co-located. @Bob -- Not only do agencies not need to be in the same location, many employees should be able to telecommute at least part of the week. But the State of New York is notoriously behind the times on adopting telecommuting. My former agency (State Ed.) refuses to even discuss a pilot project with the unions. Most of the agencies do not allow telecommuting, then OGS whines about the parking problem. I was let down by the TU article. I figured that you'd do a better article and I was right. I use Quantum GIS for my causal mapping & projection needs. Maybe a commuter tax is in order?! Bahh! City tax for state workers! I agree with Elisabeth but I can already hear the complaints about it pouring out of ESP. WRT places like B-Spa showing a gain, I'm pretty sure that's about drawing from the countryside because you have the nearest supermarkets, hardware chain stores, auto parts, fast food, etc. Charting seven days instead of Monday-Friday -- while a different exercise -- would probably reveal retail-labor clusters more starkly. Where I grew up in rural Washington County, you had to go to Bennington or Mechanicville or Troy (at least) for big-ish stores. Now you can do some of that in Greenwich. Greenwich would probably be the color of Ballston Spa today, were this map bigger. WRT Cohoes (city) and Water-vlee-eÃ© being urban yet showing workday outflows, I'd say "urban" is a loose term that means too many things. I'm thinking these are bedroom communities that laborers and retail workers leave and come home to.